A lunch and ceremony marking the topping out of Texas A&M's Plant Pathology and Microbiology Building recently took place in College Station. Designed by Flad in conjunction with Randall Scott Architects, the new building will comprise 84,000 square feet and include two plant pathology instructional labs, one bio-environmental instructional lab, teaching support spaces, 20 general research spaces with additional support spaces, an integral greenhouse, two multipurpose seminar rooms, one multipurpose flat-floor auditorium and administrative offices. 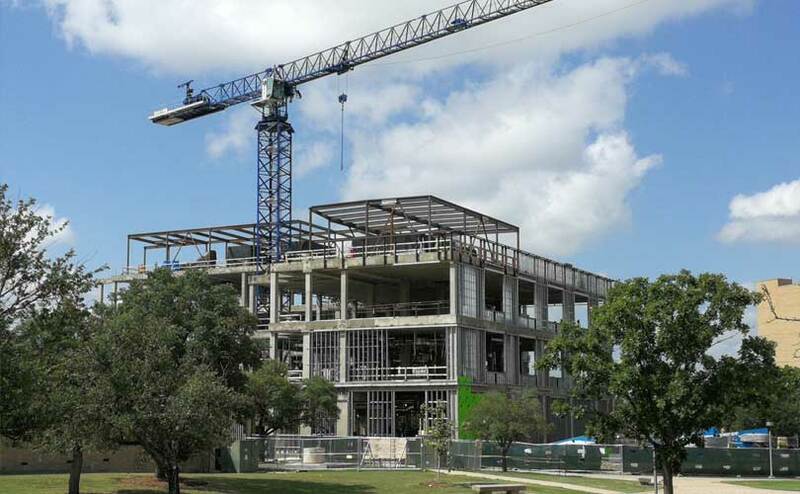 Arranged into two wings (a four-story laboratory wing and a three-story teaching and departmental office wing) and featuring classrooms and a "front porch" on the first floor, the building when completed will serve as the new home of the Department of Plant Pathology and Microbiology, and the Bioenvironmental Sciences (BESC) program. It represents one of the last components of a plan created in 2008 to centralize different departments within the College of Agriculture and Life Sciences.